1 April - 20 October. 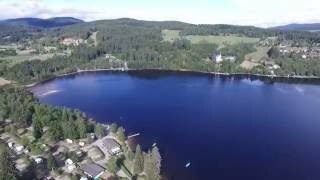 This is a pleasant site overlooking Lake Titisee in this lovely area of the Black Forest. There are marked pitches for touring units, all with electricity (16A Europlug) and on gravel terraces with good views over the lake. Pitches located directly on the lakesideare available.Trees provide good shade in some parts. The small town of Titisee Hochschwarzwald is a 20 minute walk along the lakeside and with the attractions of this part of the Forest near – Freiburg, the Rhine Falls at Schaffhausen, the source of the Danube at Donaueschingen, Basle in Switzerland – it is ideal for a long or short stay. Access to the lake is possible for swimming, boating and carp fishing. Two floorheated sanitary rooms with seperate toilets and showers.Walks are organised and there is some music in high season. Reception staff are friendly and English is spoken. The large, heated toilet block provides many washbasins in cabins, hot showers on payment, baby room (key from management) and facilities for disabled campers. Washing machines and dryer. 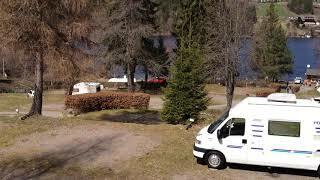 Motorhome services. Gas supplies. Shop. Pleasant lakeside bar/restaurant with terrace and takeaway. Playground. Bicycle hire. Fishing. Organised walks. Lake swimming. 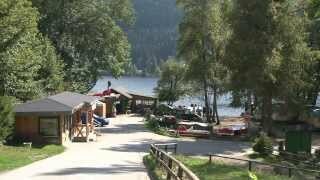 Boat excursions from Titisee. Music in season. Motorcycles are not accepted. From Freiburg take road 31 to Titisee. 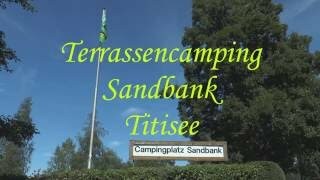 From the centre follow camping signs then signs for Bankenhof, continuing on less well made up road past this site to Sandbank.